This Sunday, I have two fun things to tell you about: a giant book and a secret project. I recently discovered that my sister and I have both been thinking about reading A Suitable Boy by Vikram Seth. After a brief discussion, we decided to read it together so we can provide moral support for one another along the way. We each requested a copy from our respective libraries. I’m actually looking forward to tackling this tome. I think having my sister to hold me accountable will keep me going. Though, I’m thinking I may have to buy my own copy, just in case the library wants theirs back, you know, sometime this year. Has anyone read A Suitable Boy? Is it worth the fear it inspires? What’s the longest book you’ve ever tackled? When not (a) working up the nerve to tackle the behemoth pictured above or (b) frantically trying to finish the books I’m supposed to have done by the end of the month, I have been hard at work on an exciting secret project. It’s not quite ready, so I won’t be sharing it today. But! Do check back tomorrow, when the secret project shall be unveiled! My plan is to highlight what new books have entered my life, what I’ve been reading, and what’s happened on Erin Reads over the past week. Please let me know if you like (or hate) this new format! I’ve had some books arrive this week about which I am extremely excited. Two showed up in the mail, and one came in at the library. “A long lost letter arrives in the post and Edie Burchill finds herself on a journey to Milderhurst Castle, a great but moldering old house, where the Blythe spinsters live and where her mother was billeted 50 years before as a 13 year old child during WW II. The elder Blythe sisters are twins and have spent most of their lives looking after the third and youngest sister, Juniper, who hasn’t been the same since her fiance jilted her in 1941. “America in the Roaring Twenties. Vaudeville was king. Talking pictures were only a distant flicker. Speakeasies beckoned beyond dimly lit doorways; money flowed fast and free. But then, almost overnight, the Great Depression leveled everything. When the dust settled, Americans were primed for a star who could distract them from grim reality and excite them in new, unexpected ways. Enter Gypsy Rose Lee, a strutting, bawdy, erudite stripper who possessed a preternatural gift for delivering exactly what America needed. Yesterday I finally finished The Portrait of Dorian Gray by Oscar Wilde for the Dueling Monsters readalong. I liked it quite a bit, except for chapter 12, which took me forever to get through! Once I finish listening to The Strange Case of Dr. Jekyll and Mr. Hyde I’ll be posting thoughts on both. I’ve just started A Thousand Splendid Suns by Khaled Hosseini for the World Party Reading Challenge. This month’s country is Afghanistan. I was unimpresed with The Kite Runner, but many people have told me they liked A Thousand Splendid Suns better. On audio, I’ve just about finished up David Sedaris’s When You Are Engulfed in Flames. I’ve read Sedaris’s books before, but listening to him read them is a completely different experience! I started the week with a Sunday Salon post in which I asked how different readers cope with awful books. There were lots of interesting replies as people chose sides: completionist or abandonist? On Monday I shared an overdue review of The Catcher in the Rye by J.D. Salinger, which I read for Banned Book Week but couldn’t quite figure out how to write. Next up was my long-awaited look Daniel Pennac’s splendid little volume, The Rights of the Reader. It’s one I think just about every reader will thoroughly enjoy perusing! Wednesday’s post was a plea for help from world literature lovers; I needed suggestions for my World Reading Challenge books for the year. I was thrilled that so many people offered recommendations. If you have any to add, I’d be quite glad to hear them! 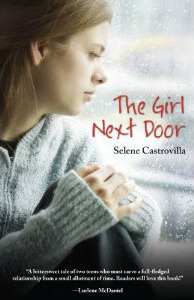 I reviewed The Girl Next Door by Selene Castrovilla on Thursday. It’s a young adult novel about two friends, one of whom has terminal cancer. Just one minor quibble, and the rest I quite liked. Finally, yesterday, I began a Friday miniseries discussing audiobooks. I quite love them and, over the next few weeks, will be highlighting some of my favorites in different genres. How was your reading week? Do tell! I’ve listened to 25 audiobooks so far this year. I just checked. Frankly, I’m a bit blown away by that number. What prompted me to look at my list was a post by Melanie at Reclusive Bibliophile, who just finished her first audiobook and is looking for suggestions for what to pick up next. As I scanned my LibraryThing collections for recommendations I could pass along, I found myself thinking about the first audiobook I finished and the impact it had on me. I only started listening to audiobooks in 2009. Before then, I didn’t really “get” them. I’d heard bits and pieces of various productions, all of which I hated. They came across as phony, overdramatic, and sometimes even painful to listen to. I didn’t understand that, just as there are good writers and not-so-good writers, there good audiobook readers and their not-so-good counterparts. At Book Expo America in 2009, I had the pleasure of meeting Barbara Rosenblat and Cassandra Morris, the readers for Muriel Barbery’s bestselling novel The Elegance of the Hedgehog. I picked up a signed copy of the audiobook, figuring I could always give it away if I hated it. But oh. I did not hate it. I loved it. I listened to The Elegance of the Hedgehog almost nonstop one weekend, driving a total of 6 hours to and from Boston to visit a friend. I was enthralled. I could not wait to get back in my car and start driving again. The way the readers breathed life into their respective characters was unlike anything I’d ever heard. I was hooked. Personally, I’ve found I prefer audiobooks told by rather than about the characters. Pair a first-person narrative with an outstanding reader and it’s like having someone telling you her story. I’ve tried fancy productions like the Harry Potter audiobooks, but they’ve never done anything for me. I prefer the intimacy of having one or two characters talk to me. Any memoir or first-person fiction is fair game. Over the next few Fridays, I’ll be featuring some of my favorite audiobooks by group: fiction, classics, nonfiction, and young adult. These are all productions I’d recommend to anyone, whether you are new to audiobooks or have been listening much longer than I have. Of course, I’ll be asking for your recommendations on future posts. But for now, I’m curious: Do you listen to audiobooks? If so, are there certain genres or styles you prefer as audiobooks over others? If not, are you interested in trying them? I won a copy of The Girl Next Door by Selene Castrovilla during Book Blogger Appreciation Week last month. It arrived in the mail last week, and I started reading right away. As a young teen, I devoured Lurlene McDaniel’s tales of heartbreak, a phase which I have most definitely outgrown. So, when I read McDaniel’s endorsement on the cover of The Girl Next Door, I worried it would be either cheesy or overwhelmingly heartbreaking. I was pleasantly surprised to find that neither was true. Sam, the novel’s narrator, was warm and strong and real. I liked her from the beginning. The other characters, though less dynamic than Sam, were also believable, if a touch cliched. The writing was good about 95% of the time, with just a few spots that made me cringe a little. Hey, it happens. The story is as much Sam’s as Jesse’s. Yes, Jesse is the sick one, and time is given to his feelings. But I would say that more emphasis is placed on Sam and her struggle to deal with Jesse’s illness. I am thankful never to have been in a situation like Sam’s, so I’m not in a place to judge accuracy, but her reactions and thoughts felt very genuine to me. I found myself rooting for her to work through her issues just as much as I was rooting for Jesse to get well. The one thing that bothered me, that kept jarring me away from the narrative, could be considered spoiler. If you are particularly spoiler-sensitive, please skip the next paragraph! If you enjoy books along these lines, I think The Girl Next Door would be a great choice. If books like these make your toes curl and provoke involuntary shudders, best to stay away. I fall somewhere in between, and my reaction was correspondingly neutral: I didn’t love the book, but I didn’t hate it either. I think illness can be a tough topic to tackle in a novel, and I certainly wasn’t disappointed with Castrovilla’s execution. How do you feel about books that deal with illness? Are there any particularly good ones you’ve read? Do you find them difficult to read? Readers of the World, I Need Your Help! Okay, readers, I need your help. I’ve joined the World Party Reading Challenge, hosted by Packabook, who took over from Fizzy Thoughts. I’m really excited to read more world literature! But first…I have to find it. September 2011: India – I have some ideas, but would love suggestions too! Do you have a favorite book set in (and possibly by an author from) any of these countries? Or maybe one you’ve heard great things about and are dying to read? I would love to know about it! Feel free to gush in the comments, or even leave a link to your review, if you’ve written one. Thank you!